It's a wonder what a deadline will do. I've always had mixed feelings about whether such pressures helped or hindered artists. When I was younger and more romantic about the nature of art I leaned toward the former - a real artist needs total freedom. As I got older and in fact not too much out of my youth I began to disagree with this and see that the most freedom and innovation comes when working against a constraint - deadline, patron or whatever. Still it's one thing to know it in theory and another to actually experience it. As I've prepared for various shows, particularly over the last few years, I've found that the pressure to get something done has often prompted me to try something new. For me this time around that means working from photos, both in the last Cape May Warbler watercolor and in this Northern Shovelers watercolor. With ducks in particular it's so easy to get hypnotized by the complex patterns in the feathers. 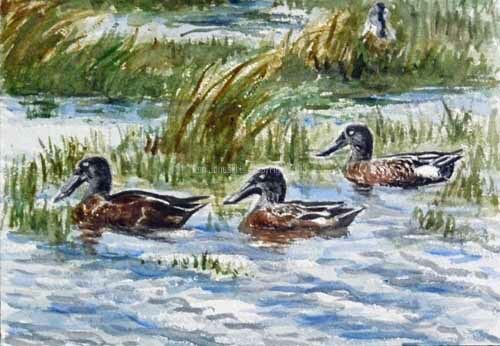 But I've tried to avoid that here and just get a sense of the ducks and their beautiful black heads and long bills. When I did the sketch for this it almost looked like a mistake. Those bills were just TOO long. But that's the way they are. I think they look large in the actual painting but not monstrously so. There's a good chance this painting is done. I have a tendency to overwork watercolor so I'm tempted to just leave it as it is. If I get it framed in time it should be in the Members Show at the Manayunk Roxborough Art Center, which opens this Sunday. Every Junco that flies across the backyard makes my heart skip half a beat, hoping it's the return of the Nashville Warbler from Saturday. I still have some vague hopes of seeing him, based solely on my experience with birds that seem to be one-hit wonders, then reappear. But we only saw him for a 30-60 minute period and my guess is that he is gone. While looking through some of my photos today I ran across a number of a Cape May Warbler drying himself off after a bath in one of the small meandering streams at Magee Marsh in Ohio, right next to the boardwalk. Since there's a Members' Show at the Manayunk Roxborough Art Center this weekend and I'd like to put in something new I decided to experiment once again with the Cape May. I've tried this once or twice before without much success but they're such beautiful birds, perhaps my favorite of the wood warblers, that I decided to try one more time. I modified the watercolor on Tuesday morning so the newest version is at top. As I've said many times I don't like working strictly from photos. That was reinforced in my recent rereading of the new Bob Kuhn book when he said that he could always pick out a painting based strictly on photos. I believe that's true. It tends to look a bit stiff and lifeless because only someone who really knows birds knows how to take liberties with them to make a better painting. I'm just not familiar enough with Cape Mays to be comfortable with them. So this relies much more on a photo than I'd like. Still it didn't make sense to let that limitation stop me. 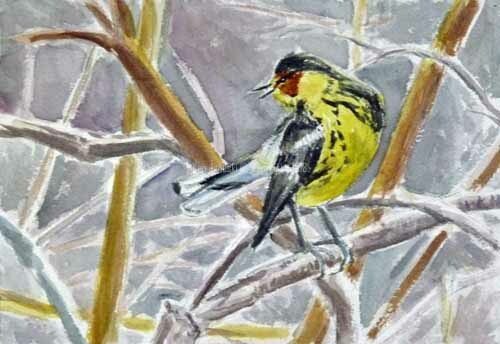 I guess I'll just have to see more breeding Cape May warblers and get more familiar with them. It's sad to say that our small urban backyard seems to have gotten worse for birds over the years, even with a lot of native plantings. I think this is probably due to the continued cutting down of large old trees in the neighborhood. In any case we rarely see much in the backyard especially in the winter. 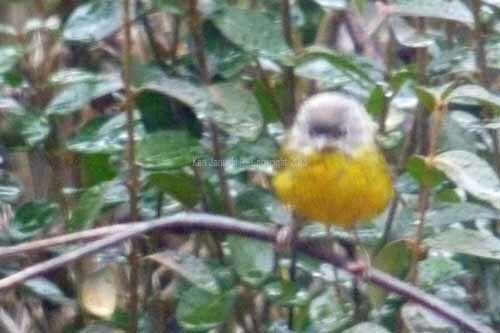 So it was a great surprise to see this bird in the drizzle today. It was with some House Sparrows but noticeably smaller. There really wasn't much doubt it was a warbler. 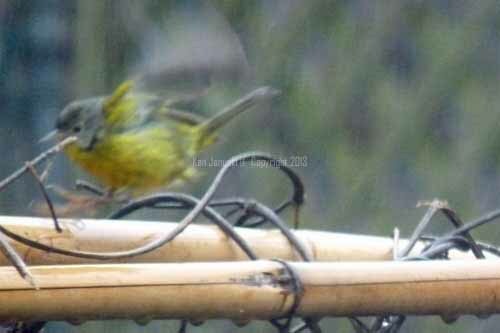 These are bad photos, shot through the kitchen window of a bird that stayed in one place just for seconds. He's been back a few times and I hope for better looks and photos. But for now I'm posting it online hoping that some of the readers of the PA Rare Bird List will agee that it's a Nashville. I can't really see it being anything else. Hopefully I'll revise this later with better photos and perhaps a sketch or watercolor. He didn't come back but I did do a quick watercolor based on one of the photos that is now at top of post. I'm still hoping to see him again tomorrow. Since posting this I've read that Nashvilles are very early migrants that use the Mississippi flyway. I wonder if there's any chance he was flying there and got pushed over here by huge storm of recent days? Yesterday I concluded the GBBC with a marathon day at Tinicum(John Heinz NWR). Unfortunately the impoundment had frozen over and there was almost nothing on it other than a few Ringed-billed Gulls and some sparrows along the shore. Darby Creek on the other hand was not frozen and a bit more lively. We really don't see that many ducks in breeding plumage so that was one of my goals in going to Tinicum yesterday. But as I said there were very few there. 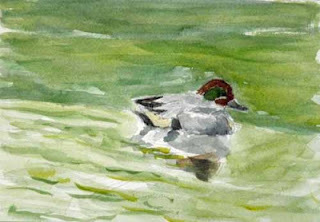 However I did manage to see my first Green-winged Teals of the year as portrayed at top in a small 5x7 inch watercolor. Like many birds these seem to settle down just beyond the range of my binoculars where I can ID them but really can't see enough to do much of a sketch. The watercolor is based on a few photos that I took. So I ended up with no satisfying looks at ducks in breeding plumage but I did walk a LONG way there, familiarizing myself with new areas. So perhaps as the weather warms and before the ducks fly I'll get another chance for some good views. A few years ago we were birding at 'The Meadows' in Cape May in New Jersey. A fellow who was visiting his mother there and riding around the preserve by bicycle stopped to talk to us. It was obvious that he thought looking at birds was a mighty odd activity and couldn't possibly be interesting. Until we let him look through our scope at the ducks. When you get a good look at a duck it's hard to be impressed by much else in the world. They have an intricate beauty that's hard to beat!! Perhaps next time we go to Cape May we'll run across him and his new scope. Beneath the watercolor is my sketchbook from the GBBC. Nol much in the way of sketches. But it was pretty cold most days, generally below freezing. But I do want to keep up the practice of sketching as much as possible. Each time I do I learn something. The illustrations I've done for the last four posts are really more illustrations than anything else. They are all done in 30-60 minutes with no intention of being 'finished' work. They're just meant to illustrate the day. There is something quite rewarding about that type of work however. It can get me to try things I normally wouldn't. Who knows where they may lead but my guess is that at least one of them will be the basis for a future print or painting. I ended the GBBC with 42 species. It would have been 43 if I included the House Sparrows of the backyard. A high count wasn't my goal but once you start counting it does become hard to stop. Still that's not why I bird and I probably won't do such an extensive count again. But it was fun and it continues to grow. My guess is that the organizers will have a wealth of useful data about birds in the US and the world when they're done. This year the data was entered through ebird and already offers an amazing view of the data entered. I spent last evening checking to see where some of the more unusual species I'd seen in Philadelphia had also been seen and how many had been seen. It was fascinating. My one reluctance and hesitation about all of this online data is that it can become easy to see the numbers and nothing else, missing the entire point of birding and being out in nature in the first place! It was hard work out birding today what with wind and cold temperatures. But the title refers not to me but to birds searching for food in winter. One of the first birds I saw today was a little white puffball amidst many gray and brown twigs. It looked so bright and fluffy that I assumed it was something manmade, some sort of plastic detritus stuck among the vegetation. When I checked though it was a male Downy Woodpecker, much rounder than they normally are, due I'm sure to both the cold and the unusual perspective. Later I ran across more downies. One in particular was very close, down on the ground, first pecking at twigs then rustling through the leaf litter, picking ferociously. That's when I realized anew that getting food is indeed hard work for birds at this time of year. Birds at feeders, especially the eminently cute Downy Woodpecker, can look almost as though they're putting on an endearing show for us. But today's views of the downies in particular show something different, they're working very hard just to stay alive. As I said it was tough birding today. In 3 hours I saw a total of just 12 species. I knew when I decided to bird a familiar section of the Wissahickon today that I probably wouldn't up my count total for GBBC. But I've birded the Wissahickon each count for many years and I hated to skip it this year. 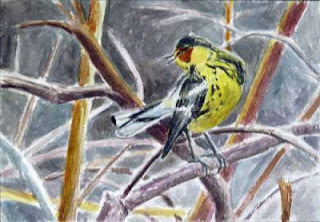 Birding often offers the thrill of the hunt and/or the pleasure of being outside on a beautiful day. Those latter days might go in the 'happy to be alive' category. Sometimes at Cape May in the fall, and in numerous other circumstances you can get great birding and great days. And then you can get great birding in miserable weather. I can remember many a colorful warbler seen at Shenandoah National Park in 40 degree very rainy weather. And then there are days like today, when the birding is hard and not very rewarding but the day is as beautiful as could possibly be. That was today, full sun and blue skies. A good day to be alive, even if the birding was nothing to write home about. A very overcast day today didn't make for a very inviting day two of the Great Backyard Bird Count. Still it was an opportunity to be out and about. I finally reached my 50th bird of 2013 in Philadelphia when I spotted my first Common Grackles of the year at Andorra Natural Area. Other than that though it was very quiet, almost as though the birds too decided it best to sleep in. After Andorra I stopped briefly at nearby Morris Arboretum. When I small raptor in the large dead tree in front of where I parked my car I expected the familiar American Kestrel that has been frequenting the area. But it just didn't look right. Finally I realized that it was a Merlin. Species number 51. It was also very quiet here, though that might have been partially due to the Merlin. 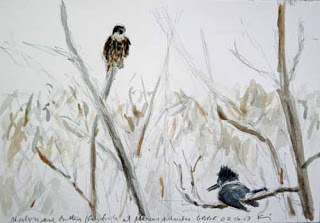 It didn't seem to bother the Belted Kingfisher though, who was on the same large tree simultaneously with the falcon. The small 30 minute 5x7 inch watercolor above is based on field sketches and photos from that scene, rearranged to suit my artistic purposes. Icterids are always a sign of spring. I assumed that I'd see Common Grackles one of these days. Another sign of spring was a singing Red-winged Blackbird at Morris. At one point they'll drown out all the other birds I'd rather hear but that time is still 4-6 weeks away. For now it's nice to hear their song. And as usual it's nice to be out birding for GBBC. You never know what you'll see. I believe the Merlin is only the second I've ever seen in Philadelphia. I can't complain about seeing him either. We started the Great Backyard Bird Count for 2013 by birding Manayunk Canal and a small stretch of the Schuylkill River which joins it. 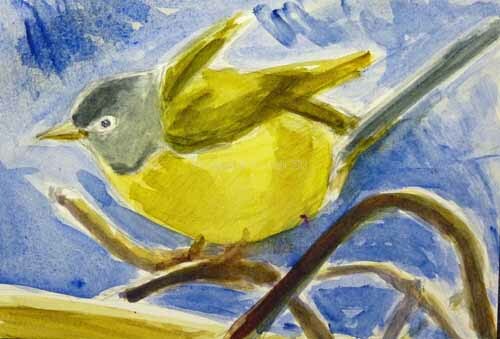 The watercolor above is a composite of birds seen today, drawn and painted primarily from memory. I did do one field sketch of an oddly posed Great Blue Heron but it's not good enough to show. So instead I thought it made sense to do a quick watercolor from memory. We saw the Common Mergansers and Pied-billed Grebes together though not quite as close together as this indicates. They were in the Schuylkill River near where it joins the Manayunk Canal. It was also nice to see one Black Vulture so I've added him behind them, though in actuality I never saw him on that side of the river. Artistic liberty! I don't see Common Mergansers all that often and never quite as close as this indicates. Pied-billed Grebes I see more often than the merganser, and closer, but still not all that often. So I first did this strictly from memory then looked at my photos and other references to fine tune them. This is a very rough sketch with very little detail. But its purpose is not to serve as a field guide, nor as great art. 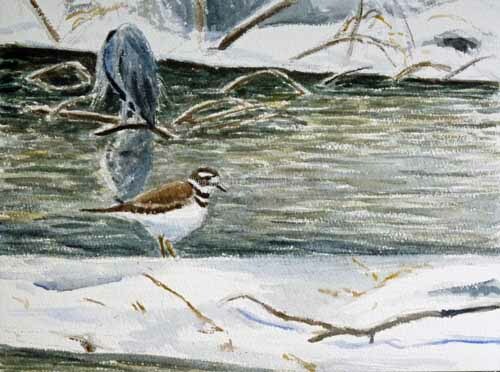 Just a reminder of an enjoyable day out birding in winter. The start of the Great Backyard Bird Count tomorrow coalesced nicely with what I think will be the finished version of the Killdeer and Great Blue Heron watercolor. It was the Great Backyard Bird Count along with Audubon Christmas Counts and Keith Russell and DVOC's Philadelphia Mid-winter Bird Census that first got us in the habit of winter birding. Obviously I didn't see this scene or anything like it on the GBCC since I saw it a few weeks before the start date. But it illustrates the type of surprise that can await any one who birds in winter. Much, if not most, of the count I think takes place closer to home, often in backyards. But I always use it as an opportunity to see what is around the more extended neighborhood. It's also a great antidote to cabin fever, something that some people seem to experience by this time in February. 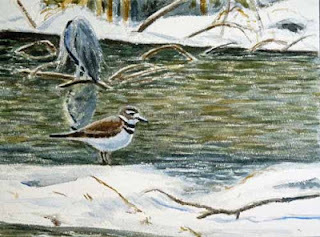 Ever since I saw the Killdeer and Great Blue Heron in the snow at the Manayunk Canal I've wanted to do a developed work based on it. Earlier I showed a quick watercolor sketch. This is more developed on Arches 300# 9x12 inch paper. The last thing I added were the details and shadows in the foreground snow. That area had been blank. But now the whole painting looks a bit busy. So I think it's time to leave it sit. Only time will tell if I can actually keep my hands off of it for a day or so. I do think the heron has turned out well.Only the top of his head was visible and I think I've captured that. But for some reason the whole painting just doesn't quite add up yet. The combination of difficulty getting ebird to acknowledge that Chipping Sparrows are at Andorra, now resolved, and a desire to continue to study local sparrows prompted this somewhat large watercolor. It is 12x16 inches on Arches 140# paper. I have to say I and this paper just don't get along this well. I always seem to get sloppy brushstrokes with it, though that could easily be my fault not the paper's. Still I am fairly happy with the waterolor. One problem I run into with paintings like this is that in trying to orchestrate the entire painting I may inadvertenly change something in the main subject so that it is no longer as much of a definitive study as I'd like. I think the birds here stayed fairly accurate but I do wish I'd left most of the green out of the background. My point in doing this was to illustrate that chippers are here in winter, when most of the greenery isn't!! Well you always learn something. I am trying to continue to work larger in watercolor. Sometimes you just need to do enough work that you start to get comfortable with it. I hope that will be the case with large watercolors. I'm completely enamored of them in the hands of some artists. For me my own still don't have the freshness that I'd like. Before I could figure out what it was I saw an undoubted shorebird on the spit of snow covered land in front of me. 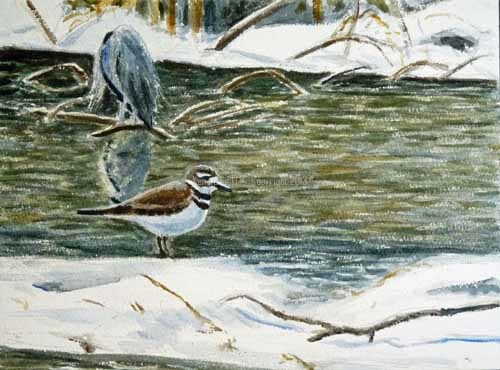 Killdeer! The first of the year. I've never seen one so early. And yet a quick check of ebird showed that it's certainly not the first seen in Philadelphia this year. We used to see them with some regularity on March 15. That seemed extraordinarily early. Thanks to ebird it's now much easier to see just how early birds really are. It was too cold to sketch today. But I did take a few photos, mainly of the Klldeer. This is very loosely based on a number of those. Basically though this is composed from my imagination. And, after the length of the last post, I'll leave it at that!!. I don't spend a lot of time watching such statistics as how many blog posts I've made. But I did notice that I was inching toward 500 and so I've paid a bit more attention. This is number 500. Above are some sketches from one of the very first posts. The following is a very lengthy post. Most likely I'll add no images other the ones above. So I know that this post will lose most readers somewhere along the line. Still it seemed like it was worth writing. So what have I learned over 500 posts and more than 6 years? That I talk too much?! That's certainly possible. If so I think I can trace it back to high school when I and two friends would go to a local diner, order only coffee, and then sit all night philosophizing and arguing. Who knows why the waitresses didn't just throw us out? Maybe we provided entertainment. I'm sure we were considered a bit odd. 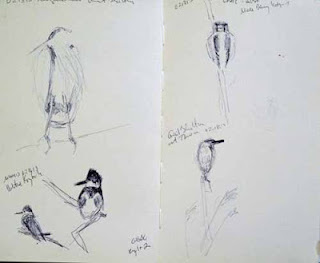 Setting that thought aside though I think there were a couple of things I originally wanted out of this blog: a place to write about my experiences in nature, particularly while birding, and a place to show my incipient bird sketches. 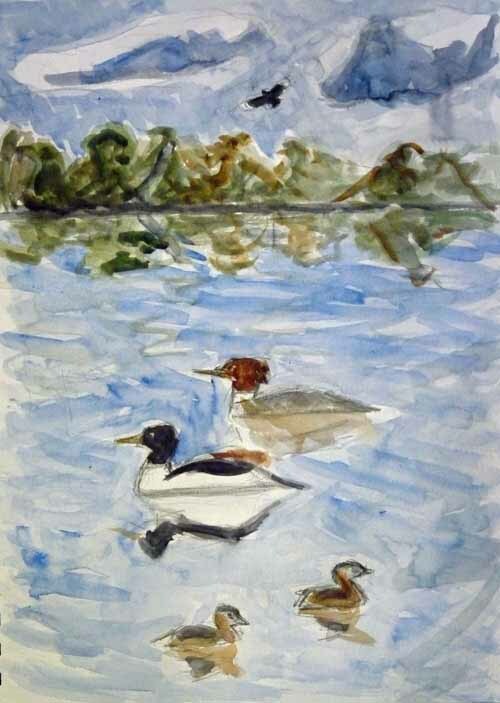 I'd decided to turn to naturalistic art, primarily birds, at the same time I began the blog, so I had only the vaguest idea of what type of naturalistic art I'd do. I think that at the beginning I expected nothing more than tentative sketches and illustrations of things I'd seen. Since I really had no background in naturalistic art I knew that they were going to be tentative. Since I have a number of advanced degrees in fine art and had spent much of my life as an ambitious, if not equally successful, fine artist it's no surprise that I soon wanted to do more ambitious work with nature as a subject. I wanted more than tentative illustrations of what I'd seen. I also soon realized that there were all sorts of people blogging about nature that were far better and more experienced and more motivated than I was. I found that I was more passionate about art and probably a bit more unusual in this passion. So my posts turned to my own nature-based art, rather than nature itself. This will get very boring if I go step by step through my very slow progress. Some recent reading has fortuitously summarized many of the themes of my years with naturalistic art. The books are: The Unfeathered Bird by Katrina van Grouw, Wildlife in Printmaking by Carry Akroyd, The $12 Million Stuffed Shark: the Curious Economics of Contemporary Art by Don Thompson, American Wildlife Art by David J. Wagner, American Birding Sketchbook by Michael Warren and Bob Kuhn: Drawing on Instinct by Adam Duncan Harris. I don't think too many readers of this blog are as interested as I am in art, the history of art and making a living as an artist. Even fewer from what I can tell are interested in what is called 'modern art', something I mentioned about a month ago: 100th Birthday of Abstract Art. Still it's always been an undercurrent in most of what I write. I think about it almost every day. To make a long, and possibly boring, story short: I've always been quite conflicted about my background as an abstract artist and my new interest in representational art, especially what's often referred to as 'wildlife art', a type of art often despised by the galleries I used to desire to show in and one generally given very short shrift by the establishment art world of which I used to be a part. If I were to summarize my experience I'd say that it has been a greater and greater appreciation for at least some wildlife art as well as greater and greater criticism of contemporary art, so much so that I'd say it's become almost anti-art. The books mentioned above all are indicative in some way of this. I don't think by any means that they are the only books that would lead to this conclusion. They're just all very good books and ones that I happened to be reading over the last few months that all seemed to reinforce my thoughts and feelings. One of the first things I noticed in my bird art was that I didn't understand their structure. What did all those feathers do? Were they all the same? Was their any similar pattern in the feathers of both sparrows and gulls? I still give most small birds a neck that they don't have, stretching it out far more than I should. So over time, and over many questionable drawings and paintings here, I've learned something. Much of this has been helped by field sketching, something I was horribly unsuccessful with until I started frequenting the Wildlife Art section of birdforum.net, which at that time had numerous artists who were fully devoted to sketching birds in the field. I say 'at that time' because this forum I'm afraid has paid the price of Facebook desertion and quieted down quite a bit. 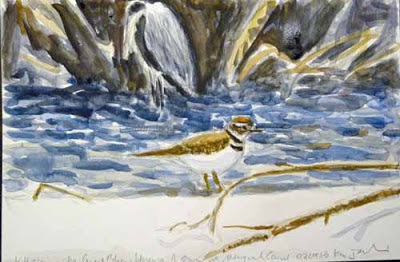 I've written much about the value, and thrill, of field sketching so I won't repeat it here. What I would like to note though is Katrina van Grouw's book, noted above. I'm not quite finished with it yet but it's a unique and wonderful book on the structure of birds, particularly their skeleton, with many, many drawings by her coupled with an excellent text on why certain birds seem to differ structurally from one another. All the hard earned clues that I've picked up about how birds are put together are also here, along with many I've not yet picked up, portrayed and explained both in text and illustration. Not everyone will enjoy looking at the musculature-skeletal structure of birds but I think anyone who's observed birds closely will. Evolution is a main theme, along with convergent evolution, which indicates unrelated species that seem to have both adapted in the same way so that they look like they're related. It really is a fascinating exploration of birds and their structure. 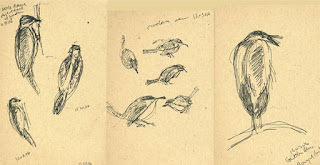 My very first bird works were vigorous charcoal drawings based on photos of birds I'd taken. But I soon saw that photos only showed part of birds and I was at a complete loss as to what was happening in the blurred, indistinct or hidden parts. I knew from the start that I didn't want to fudge this. But neither did I want to be limited by it, i.e. I didn't want to end up doing scientific illustrations just to show I understood the structure. I think what I find so rewarding about this book is that it helps to crystallize my understanding of the structure of birds, and show how closely it is related to their lifestyle. 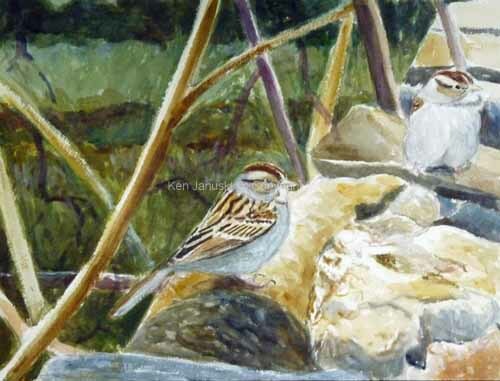 That type of knowledge is easy to keep in mind in any type of bird portrayal, realistic or abstract. So that is one thing that I think this blog has touched on, over and over, trying to understand how birds are put together so that whatever work I do, no matter how abstract, looks like I'm actually familiar with the birds and haven't just picked up some random photo and started copying. Another theme is background and environment. Birds don't exist in a vacuum, nor does any living creature. And subjects in art don't either. One of the first things you should learn as an artist is that you can't just plop your subject down in the middle of the canvas or paper and expect it to be exciting. All in all I'd say that this is the biggest mistake of wildlife artists, the one that most makes their work dull. 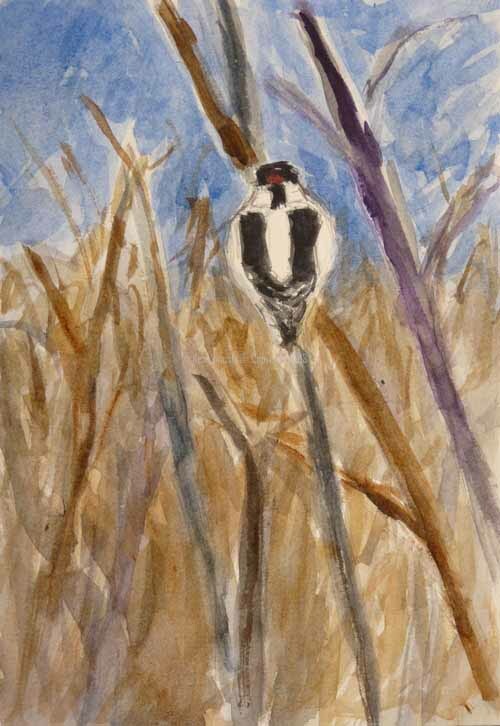 Many people, probably far more than you'd imagine, are capable of making a passable rendering of birds, animals or just about any other subject. But just as music is not just melody, or not just rhythm, art is not just a subject realistically portrayed. Compostion is an extraordinarily important part of art. I was very well aware of this in my abstract art. Matisse famously said that his paintings were done when everything was in its proper place, i.e. every little bit of the painting was important. Because I firmly believed this I had a very hard time with the poor or non-existent composition of so much wildlife art. One common solution was the vignette, where the subject is in the center, surrounded by a light halo that fades to nothing as it reaches the edge of the paper or canvas. I myself have tried all sorts of impressionstic, slightly abstract backgrounds, none very successful. I quickly realized that this was another major aspect of naturalistic art that I needed to contend with. So much of this blog, either in word or in the art itself, has been about my attempts to compose bird art. Both the Bob Kuhn and the Michael Warren book have been interesting to read and view in this regard. Though Kuhn worked for many years as an illustrator and thus almost by definition had to include more or less realistic backgrounds he was also good at composition. When he dropped illustration work at age 50 to devote himself to fulltime paintng he eventually minimized the background to where it was almost abstract. I confess I'm really new to his work and hadn't seen much of it until I got this book. So I'm reluctant to say all that much about him. What I know is from reading this book and looking at the art involved. But he has surprised me by showing an unexpected solution to composition and environment in wildlife art: minimize it but based on what you know. He does a wonderful job of making believable backgrounds and environments that are quasi-abstract. Michael Warren on the other hands goes in the opposite direction. Often his work especially in the book mentioned above, devotes more space to the environment than to the bird. What is most shocking, pleasantly shocking, is that he seems to have paid attention to the surrounding environment. All the trees, limbs, foliage, water, rocks, etc. look right. And yet they're not photorealist detailed renderings ala Robert Bateman, but something I much prefer a fresh, more abstracted version of them. So much realism seems musclebound, as though it can't break free from the chains of minute detail. Warren's work shows the same knowledge of the environment but portrayed, at least to me, in a more artistic way. In any case both books have been revelations about how to situate a bird in its surroundings and on paper or canvas in such a way that it both seems believable and also has all the excitement of the best art. I'm really not sure which direction my own work will go from here. But both of these artists show high quality examples of two very different directions. And they both illustrate another theme that has been very important to me throughout this blog. I should add that though I think my talents lie more in the line of Kuhn I'm partiularly impressed with Warren's accomplishments. As I've struggled with being a 'wildlife artist,' I've often wondered why some artists work the way they do. Why the slavish devotion to photographic detail, a truly stultifying style of art most of the time. A somewhat surprising answer came to me via David J. Wagner's book: to pay the bills. I've never made a living as an artist, abstract, wildlife, or anywhere in between. The best I did was teach art at the college level for a few years and that is far different than making a living from your art. When you're trying to make a living from your art things are a bit more complicated. The fascinating thing about his book is seeing how this has played out through history. We tend to forget that people didn't always have sporting vacations in the Adirondacks or anywhere. The notion of 'sport' is relatively new. In any case various artists, from Arthur Fitzwilliam Tate to Winslow Homer, were able to make their living by portraying the wilderness that was being explored for 'sport' in 19th century America. I know Homer better than Tait and for him I'd guess it was an easy enough subject since he personally enjoyed it. Still if there hadn't been a market for it perhaps we'd have a different Winslow Homer. Bob Kuhn too happened to paint African wildlife just at the same time that there was a market for it, especially from safari hunters eager to remember their adventure. By contrast the early Bob Kuhn as well as many other wildlife artist had only one way to make their living in the early to mid 20th century - magazine illustration. Coming from the art for art's sake tradition, where it was almost suspect to make a living from art, I tend to forget that many artists had to do what their clients wanted. The great British artist Charles Tunnicliffe seemed to have commissions almost all his life, even at at time of great fame.So often artists have had to do what they were paid to do, not what they might have personally wanted to do. Kuhn's paintings after age 50 are far stronger than his illustrations but it took him until then to believe it was safe to risk his economic well-being on art as he wished to do it. There are of course other influences on art mentioned in the Wagner book, including the many artists, such as Louis Agassiz Fuertes, who made their living more in the scientific sphere. Another book on wildlife art whose name I don't recall offhand mentions how many wildlife artists didn't begin painting the way they wanted until they retired from scientific jobs, often with natural history museums or universities. I'm not sure that this makes me like some of the work anymore but it does help to explain why wildlife art is the way it is. 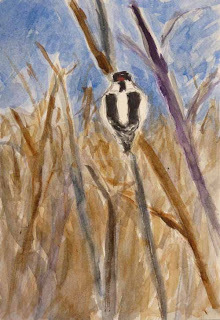 For me that has been important because I've always felt like the round peg in the square holes of wildlife art. Another theme of Wagner's book is the long history of conservation and environmentalism in wildlife art. That too has been interesting and rewarding to see. And it brings up an interesting question. What is more important, liking the style of another wildlife artist or sharing some kinship with his concern for wilflife even if rendered it a thoroughly different or even distasteful style? There's no obviuos answer to this but it is something I've often thought about. I can admire many things about Robert Bateman's paintings but I rarely really like them. On the other hand I thoroughly admire and like him as an enviromentalist. These previous books, at least for me, help to explain my place in wildlife art, something that I think has been a major theme of this blog through the years. I've always been uncomfortable in the role of wildlife artist. The last theme is the other side of this: my relation to contemporary art and the state of contemporary art. If you've made it through this far, in what surely is my lengthiest post, I'll reward you with the postive first. I love much of modern art, for example Matisse, Cezanne, Stuart Davis, Mondrian, Richard Diebenkorn to name just a very few. My hope when I began wildlife art was that I could use a modernistic style with a naturalistic theme. I wish I could show you a book by the very talented Nick Derry but the best I can do is show you this link to his Nick Derry Facebook page. Carry Akroyd's printmaking book mentioned at top shows some artists who I think do exactly this. Many are members of the Society of Wildife Artists and this help explains why I've spent huge amounts of money to send my work for their last two annual exhibits. It's the only venue I know of that seems to combine modern art and wildlife art. One artist who is particularly successful at this I think is Kim Atkinson. Some of her work is in the Akroyd book. One theme that I think is particularly interesting is what I'd call synesthesia. the use of one sense, or medium, to evoke another. Early abstract artists talked about this as a goal, where their art also evoked music among other things. One or two of Atkinson's works include sound in their title. And I think that's exactly what modern art is capable of. It is capable of portraying, or evoking, the sense of spring, including the chatter or birds, the smell of lilacs, etc. So this book reminds me of what has always been a goal of mine, to keep the broad expressiveness of modern art in my representatiaonal art. I think this is more often a goal than an accomplishment and often I work more traditionally. But it is a huge, if underlying theme. Finally we have contemporary art, and the cost of art. I dropped abstract art 10-15 years ago out of disgust with the contemporary art world. I'm only more disgusted now. But I no longer spend any time with it so it's not so bad. From a distance I've theorized as to what seems so wrong with it. I've also theorized as to why you'll never see wildlife art in an art musuem and rarely any galleries other than 'wildlife art' galleries. My conclusion was that contemporary art is now strictly a world of finance and financial speculation. This is not to say that all artists believe this but my own experience with art schools is that art students quite eagerly follow the leader, even if the leader is a 'shocking' artist. So everybody is 'shocking' together. I can't prove any of this and don't want to spend the time or energy doing so. But I did fnally decide to read a bit about it. The Don Thompson book is revelatory. It's mainly a reporting book rather than a critical analysis, i.e. he's not as appalled as I am. In fact he's an occasional collector himself. But it does show how the contemporary artists who sell for millions got where they are. It shows the tremendous monetary incentives for artists, dealers, auction houses, museums and collectors. To me it's a sick world. There's no other way to put it. Art is no longer important and money and prestige are. Contemporary art is bought, and sold, for financial gain and/or to keep up with the Jones, the hedge fund manager Joneses. This really isn't of much importance to me, except that I think it does degrade the long and honorable tradition of art. Of course I could be accused of philistinism, but who hasn't over the last 150 years? It's an insult that no longer has meaning. But what's saddest about it is that there are so many legitimate artists, including many wildilfe artists, who will never sell, never be shown in museums or galleries while instead the stuff mentioned in this book will, most selling for over one million dollars. I'm not going to go on any futher with that particular depressing theme. What I've found interesting in the book is that it makes me feel more strongly than ever that today's art work has nothing to do with art and has no place for me in it. In other words it solidifies my convicition that today I'm truly wildlife artist. With ALL of that said perhaps my future posts will deal less with thoughts about art and wildlife art and instead just concentrate on my artwork and the nature that has inspired this. If you've gotten all the way through this: CONGRATULATIONS. I know it's been very long and self-referential.